In Matomo, you can create Custom Alerts to automatically be notified of important changes on your website or app. 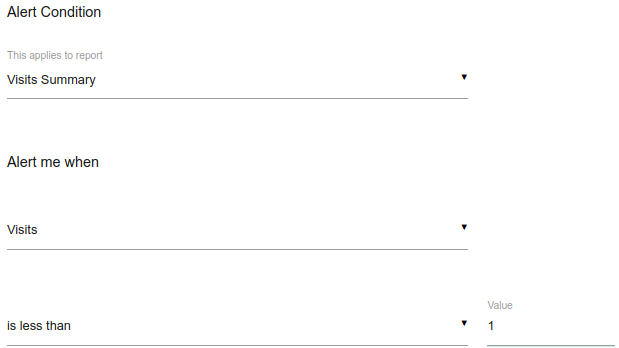 They are a great way to save time, but they also spam your mailbox quickly. Defining good custom alerts takes therefore time and requires some preparations. Here are recommendations on what you should focus on to only get the right alerts at the right time. Do you really want to be alerted? If the answer is no, then do not use this feature. What is the level of this alert? Not important, interesting, highly critical… if it is not highly critical, do not define an alert for this. Probably the emailing report or custom reports feature will be a better fit. How would you like to be alerted? SMS, email, sound, homing pigeon (unfortunately we do not support this feature at that time). If you are looking at your emails once a week, then defining a daily email alert won’t make sense. How would you like the alert to be named? Give your alert the most explicit name, that’s the first information you will see when you get alerted. What will be the next step once the alert is triggered? If you cannot find any action once the alert is triggered, then probably an alert doesn’t make sense. 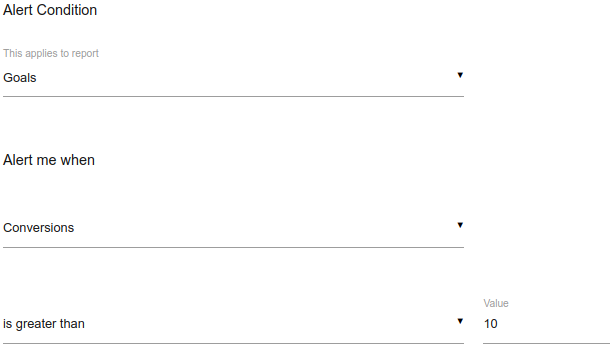 Once those questions are answered, you can start configuring custom alerts. There are many alerts you can define but as just mentioned, which alerts you should create always depends on your goals and what is critical to you, or your business. Let’s look at some custom alerts that we see quite often. Here the action we will take is to have a look at the website in order to see if it is still live. If the site still works, we will look at the tracking code in order to see if the website is still correctly tracked or not. Convinced of this custom alert? Let’s look at another example. Let’s say you gave a goal to one of your employee to reach a specific threshold in terms of conversions. You can then define a custom alert in order to inform you when the threshold has been reached. You can simply do this with an alert saying “Target achieved by Franck” where number of conversions equals the number of actions you defined with him. It takes you only a minute to define something you would have missed otherwise. Here the actions we can think of are either to congratulate Franck or to ask him what is going wrong if the target is not achieved. 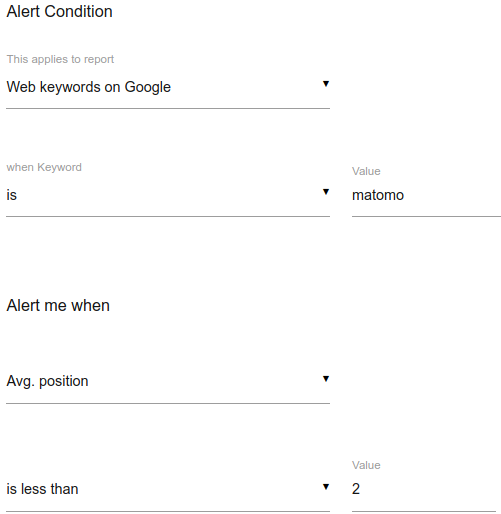 Did you know that you can also take advantage of Matomo premium features to define custom alerts? Let’s see one of them. If you are using the Search Engine Keyword Performance premium feature, there are really interesting combinations you can use to create custom alerts. You will be alerted when your website is losing some positions within the search engine results for specific keywords. Here the action we could take is to investigate why we lost a position on Google for this keyword. There are many custom alert combinations waiting for you out there. Why not giving them a try? If you have any questions, feel free to ask them on the Matomo forums.